It seems that no matter where you go there is a plaque hanging on the wall to honor someone’s accomplishments. But where did that plaque come from and what did the person do to receive it? Here at Hodges, we make thousands of plaques a year, and sometimes we have the privilege of knowing the story behind the award. Recently, we were asked to make a very unique plaque that sparked our interest. We designed this custom award plaque that is significant in size, printed in full color with a lovely Celtic knot border and includes 4 photos. This plaque was nothing short of amazing and come to find out so are the woman and the horse it was made for! 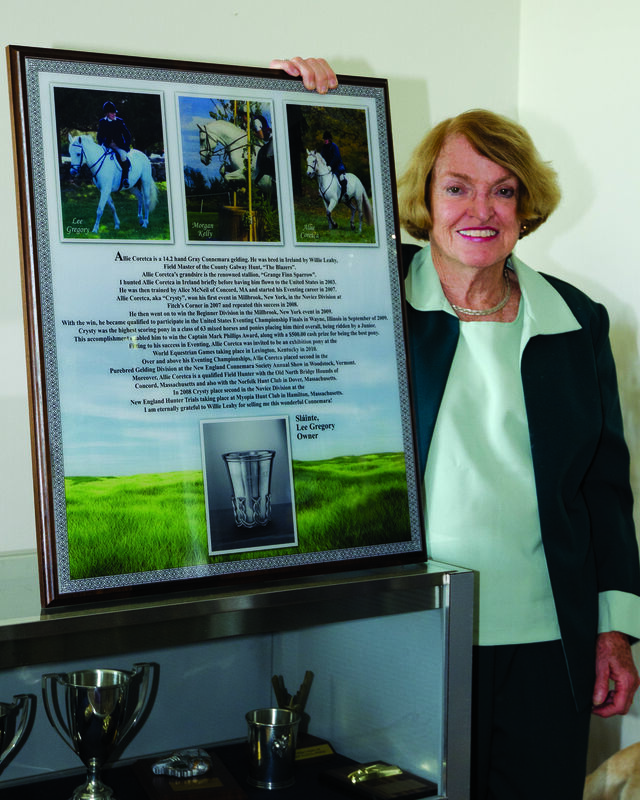 We had the pleasure of sitting down and talking to, Lee Gregory, the owner of the horse that the plaque was made for. Lee grew up in Boston, MA and started riding horses around the age of 4. She took to riding instinctively, just like her Grandfather, J.W O’Connor, who was a Irish horseman. Lee spent 38 years of her life as a first grade teacher in Cambridge, MA. A career that she was passionate about, but certainly not her only passion in life! Lee loves to travel and while on a trip to Ireland she purchased her first Connemara from Willie Leahy, the largest breeder of Connemara ponies in the world. This particular Connemara was named “Martin” and was a very special part of Lee’s life for 19 years. Lee felt one with Martin and when he passed it was a terrible loss for her. She knew that getting a new horse would be difficult, but when the day came that she was ready, she would go back to Ireland to purchase from Willie Leahy once again. Lee headed back to Ireland to see Willie sooner than she thought. Before she knew it she was riding another Connemara. At first she was uncertain if he was the horse for her. However, as she continued to ride him down the trail, her right stirrup snapped. As she was trying to keep her balance while waiting for help, she realized that the horse “didn’t take advantage of the situation and continued on”. This was the perfect selling point for Lee and she was confident in her purchase. The plaque will be going to the Dartfield Horse Museum in Galway, Ireland, where Crysty and other horses bred by Willie Leahy are honored for their accomplishments. Lee Gregory, at 80 years old, still loves to dance, swim, garden, travel and ride her beloved Crysty. We are proud to have been able to make an award for both Crysty and Lee’s accomplishments and we wish them both all the best!